1500 Longhorn, Longhorn, You won't want to miss this excellent value! 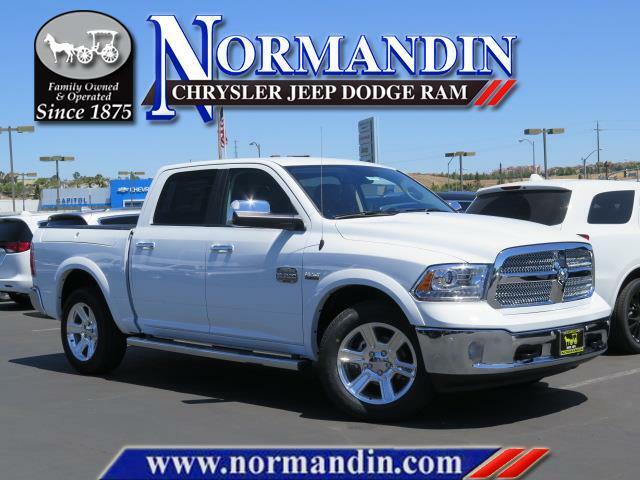 This pickup stands out from the crowd, boasting a diverse range of features and remarkable value! The following features are included: power moon roof, a bedliner, and voice activated navigation. Smooth gearshifts are achieved thanks to the powerful 8 cylinder engine, and load leveling rear suspension maintains a comfortable ride. Four wheel drive allows you to go places you've only imagined. Our aim is to provide our customers with the best prices and service at all times. Stop by our dealership or give us a call for more information., Power Sunroof,Transfer Case Skid Plate Shield,Engine Oil Heat Exchanger,Electronically Controlled Throttle,Chrome Tubular Side Steps,Front Suspension Skid Plate,Protection Group,Chrome Grille w/RAM Letters,Monotone Paint,Bright Rotary Shifter,Engine: 5.7L V8 HEMI MDS VVT,Trailer Brake Control,Transmission: 8-Speed Automatic,4-Corner Air Suspension,Premium Filigree Leather Seats,Heavy Duty Engine Cooling,Rear Window Defroster,Bright Front Bumper,Body Color Fender Flares,Electronic Shift,Anti-Spin Differential Rear Axle,Wheels: 20' x 9' Polished Aluminum,Hemi Badge,Active Grille Shutters,Tip Start,Chrome Belt Moldings,50 State Emissions,Bright Rear Bumper,Quick Order Package 26K Longhorn You won't want to miss this excellent value! 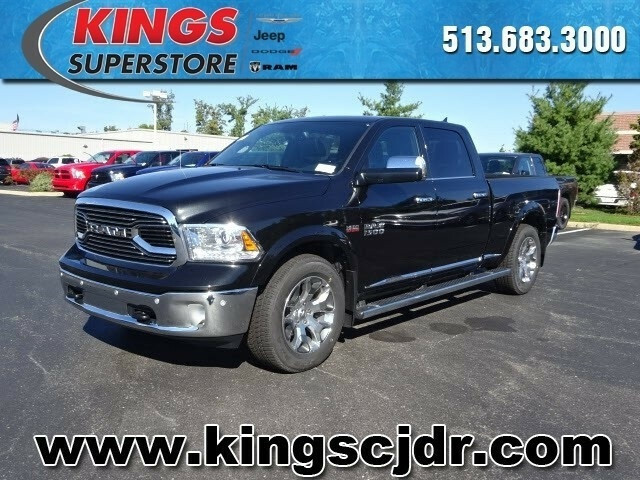 This pickup stands out from the crowd, boasting a diverse range of features and remarkable value! The following features are included: power moon roof, a bedliner, and voice activated navigation. Smooth gearshifts are achieved thanks to the powerful 8 cylinder engine, and load leveling rear suspension maintains a comfortable ride. Four wheel drive allows you to go places you've only imagined. Our aim is to provide our customers with the best prices and service at all times. Stop by our dealership or give us a call for more information. 1500 Longhorn, Longhorn, Boasts 21 Highway MPG and 15 City MPG! 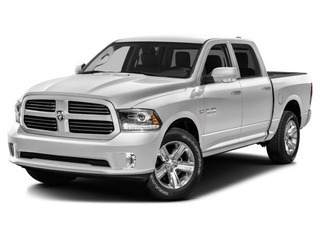 This Ram 1500 delivers a Intercooled Turbo Diesel V-6 3.0 L/182 engine powering this Automatic transmission. Wireless Streaming, Voice Recorder, Ventilated front seats. This Ram 1500 Comes Equipped with These Options Variable Intermittent Wipers, Valet Function, Underhood And Pickup Cargo Box Lights, Uconnect Access Emergency S.O.S, Trip Computer, Transmission: 8-Speed Automatic (8HP70), Transmission w/Driver Selectable Mode, Sequential Shift Control w/Steering Wheel Controls and HD Oil Cooler, Towing w/Harness and Trailer Sway Control, Tires: P275/60R20 BSW AS, Tire Specific Low Tire Pressure Warning. 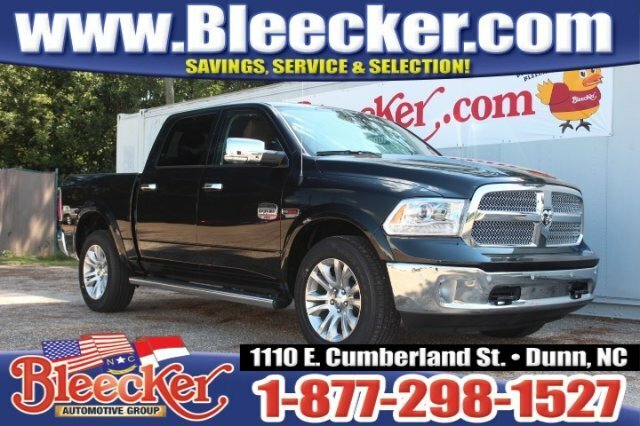 Stop By Today For a hassle-free deal on this must-own Ram 1500 come see us at Bleecker Chrysler Dodge Jeep Ram, 1110 E Cumberland St, Dunn, NC 28335. Just minutes away!, Bucket Seats,Transmission: 8-Speed Auto,Remote Proximity Keyless Entry,26 Gallon Fuel Tank,Chrome Tubular Side Steps,Electronically Controlled Throttle,115V Auxiliary Power Outlet,Folding Flat Load Floor Storage,Keyless Go,Quick Order Package 28K Laramie Longhorn,Power Lumbar Adjust,230 Amp Alternator,Next Generation Engine Controller,Selective Catalytic Reduction,Engine: 3.0L V6 Turbo Diesel,3.55 Rear Axle Ratio,Auto High Beam Headlamp Control,Monotone Paint,Rain Sensitive Windshield Wipers,Trailer Brake Control,Ventilated Front Seats,Convenience Group,Rear 60/40 Split Folding Seat,Premium Leather Bucket Seats,3.0L Diesel Badge,Heated Front Seats,Bright Front Bumper,Body Color Fender Flares,Wheels: 20' x 9' Polished Aluminum,High Back Seats,Heated Second Row Seats,Maximum Duty Engine Cooling,GVWR: 6,950 lbs,Single Disc Remote CD Player,50 State Emissions,800 Amp Maintenance Free Battery,Bright Rear Bumper,Power 10-Way Memory Driver and 6-Way Passenger Seats Boasts 21 Highway MPG and 15 City MPG! This Ram 1500 delivers a Intercooled Turbo Diesel V-6 3.0 L/182 engine powering this Automatic transmission. Wireless Streaming, Voice Recorder, Ventilated front seats. 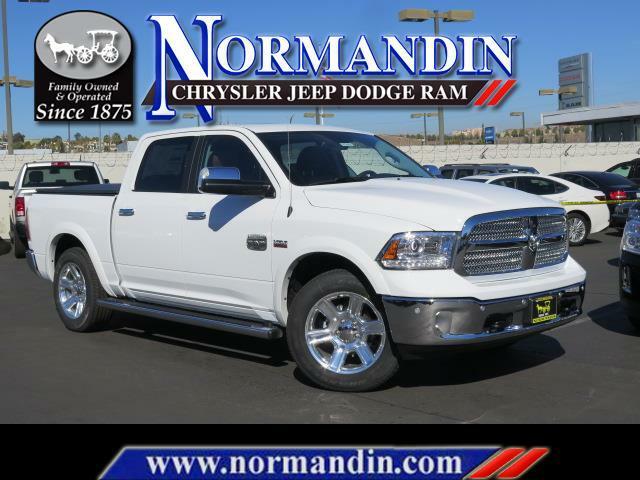 This Ram 1500 Comes Equipped with These Options Variable Intermittent Wipers, Valet Function, Underhood And Pickup Cargo Box Lights, Uconnect Access Emergency S.O.S, Trip Computer, Transmission: 8-Speed Automatic (8HP70), Transmission w/Driver Selectable Mode, Sequential Shift Control w/Steering Wheel Controls and HD Oil Cooler, Towing w/Harness and Trailer Sway Control, Tires: P275/60R20 BSW AS, Tire Specific Low Tire Pressure Warning. 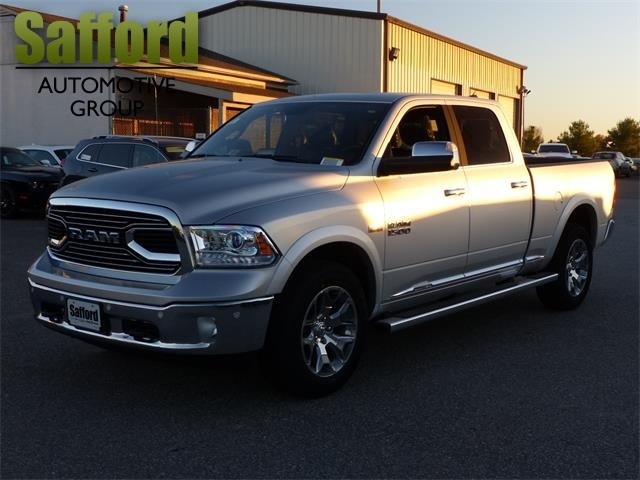 Stop By Today For a hassle-free deal on this must-own Ram 1500 come see us at Bleecker Chrysler Dodge Jeep Ram, 1110 E Cumberland St, Dunn, NC 28335. Just minutes away! 1500 Longhorn, Longhorn, You won't want to miss this excellent value! You'll appreciate its safety and technology features! Top features include leather upholstery, heated and ventilated seats, rain sensing wipers, and the power moon roof opens up the cabin to the natural environment. It features four-wheel drive capabilities, a durable automatic transmission, and a powerful 8 cylinder engine. Our experienced sales staff is eager to share its knowledge and enthusiasm with you. They'll work with you to find the right vehicle at a price you can afford. Stop in and take a test drive!, Power Sunroof,Bucket Seats,Class IV Receiver Hitch,Laramie Limited Group,115V Auxiliary Power Outlet,Folding Flat Load Floor Storage,Trailer Tow Mirrors,Body Color Rear Bumper w/Step Pads,Body Color Front Fascia,Chrome Grille w/RAM Letters,Chrome Bumper Package,Wheel to Wheel Side Steps,Leather Wrapped Grab Handle,Delete Tow Hooks,4-Corner Air Suspension Delete,Engine: 5.7L V8 HEMI MDS VVT,Steering Wheel Mounted Audio Controls,Ram 1500 Badge,4-Corner Air Suspension,Ventilated Front Seats,Rear 60/40 Split Folding Seat,Heavy Duty Engine Cooling,Chrome Ram Badge,Center Hub,Anti-Spin Differential Rear Axle,Laramie Limited Leather Bucket Seats,Hemi Badge,Laramie Limited Cluster,High Back Seats,Active Grille Shutters,Tip Start,3.92 Rear Axle Ratio,Chrome Belt Moldings,Bright Rear Bumper,Power 10-Way Memory Driver and 6-Way Passenger Seats,Engine Oil Heat Exchanger,Electronically Controlled Throttle,Add Tow Hooks,Wood/Leather Wrapped Steering Wheel,Trailer Tow Mirrors and Brake Group,Luxury Door Trim Panel,Monotone Paint,Bright Rotary Shifter,Heated Steering Wheel,Trailer Brake Control,Transmission: 8-Speed Automatic,Quick Order Package 26V Limited,Luxury Front and Rear Floor Mats,Power Chrome Trailer Tow Mirrors,Limited Tailgate Applique 4x4,Rear Window Defroster,Chrome Bodyside Molding,Heated Front Seats,Wheels: 20' x 9' Painted Aluminum Chrome Insert,Bright Front Bumper,Body Color Fender Flares,Electronic Shift,Heated Second Row Seats,50 State Emissions You won't want to miss this excellent value! You'll appreciate its safety and technology features! Top features include leather upholstery, heated and ventilated seats, rain sensing wipers, and the power moon roof opens up the cabin to the natural environment. It features four-wheel drive capabilities, a durable automatic transmission, and a powerful 8 cylinder engine. Our experienced sales staff is eager to share its knowledge and enthusiasm with you. They'll work with you to find the right vehicle at a price you can afford. Stop in and take a test drive! 1500 Longhorn, Longhorn, What are you waiting for? Check out this 2017! You'll appreciate its safety and technology features! Top features include rain sensing wipers, adjustable pedals, a bedliner, and voice activated navigation. It features four-wheel drive capabilities, a durable automatic transmission, and a powerful 8 cylinder engine. We know that you have high expectations, and we enjoy the challenge of meeting and exceeding them! Please don't hesitate to give us a call., 26K : CUSTOMER PREFERRED PKG,DMH : 3.92 AXLE RATIO,DFK,DSA : ANTI-SPIN DIFF,EZH : 5.7 LITRE HEMI,2TK : LARAMIE LONGHORN VALUE P,AHC : TRAILER TOW GROUP What are you waiting for? Check out this 2017! You'll appreciate its safety and technology features! Top features include rain sensing wipers, adjustable pedals, a bedliner, and voice activated navigation. It features four-wheel drive capabilities, a durable automatic transmission, and a powerful 8 cylinder engine. We know that you have high expectations, and we enjoy the challenge of meeting and exceeding them! Please don't hesitate to give us a call. 1500 Longhorn, Longhorn, Included Dealer options extra. Not all Guestswill qualify for all rebates. See Dealer for details., 115V Auxiliary Power Outlet,4-Corner Air Suspension,50 State Emissions,Active Grille Shutters,Anti-Spin Differential Rear Axle,Body Color Fender Flares,Body Color Front Fascia,Body Color Rear Bumper w/Step Pads,Bright Front Bumper,Bright Rear Bumper,Bright Rotary Shifter,Bucket Seats,Center Hub,Chrome Belt Moldings,Chrome Bodyside Molding,Chrome Bumper Package,Chrome Grille w/RAM Letters,Chrome Ram Badge,Class IV Receiver Hitch,Delete Tow Hooks,Electronic Shift,Electronically Controlled Throttle,Engine Oil Heat Exchanger,Engine: 5.7L V8 HEMI MDS VVT,Folding Flat Load Floor Storage,Heated Front Seats,Heated Second Row Seats,Heated Steering Wheel,Heavy Duty Engine Cooling,Hemi Badge,High Back Seats,Laramie Limited Cluster,Laramie Limited Group,Laramie Limited Leather Bucket Seats,Leather Wrapped Grab Handle,Limited Tailgate Applique 4x2,Luxury Door Trim Panel,Luxury Front and Rear Floor Mats,Monotone Paint,Power 10-Way Memory Driver and 6-Way Passenger Seats,Power Chrome Trailer Tow Mirrors,Quick Order Package 26V Limited,Ram 1500 Badge,Rear 60/40 Split Folding Seat,Rear Window Defroster,Steering Wheel Mounted Audio Controls,Tip Start,Trailer Brake Control,Trailer Tow Mirrors,Trailer Tow Mirrors and Brake Group,Transmission: 8-Speed Automatic,Ventilated Front Seats,Wheel to Wheel Side Steps,Wheels: 20' x 9' Painted Aluminum Chrome Insert,Wood/Leather Wrapped Steering Wheel Included Dealer options extra. Not all Guestswill qualify for all rebates. See Dealer for details. -- Sunroof -- Why buy any other truck? 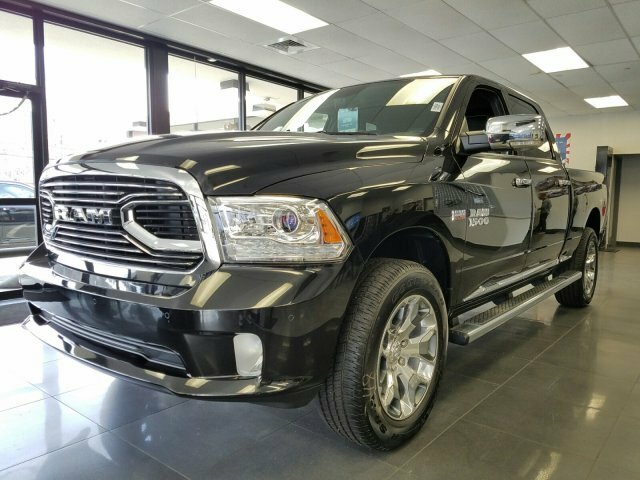 The 2017 RAM 1500 Longhorn is the King of Truck Country. 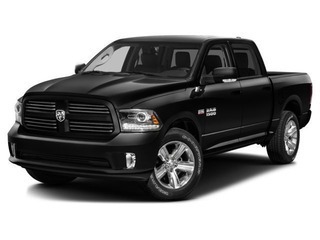 HEMI Power gives you maximum towing capability and fuel saving technology paired with an 8-speed Torqeflite transmission saves you money at the pump. Longhorn gets dressed up with exclusive finishes, fender flares, 20' wheels, and brilliant Longhorn badges. Inside you'll find a rich, comfortable interior with a touch screen Uconnect system to keep you entertained and connected with Bluetooth. Relax in heated/ventilated leather seating and wrap your hands around a heated steering wheel while enjoying the killer nine speaker sound system by Alpine. LED lighting, genuine wood grain trim, and accents inspired by the American West add to the luxury cabin. 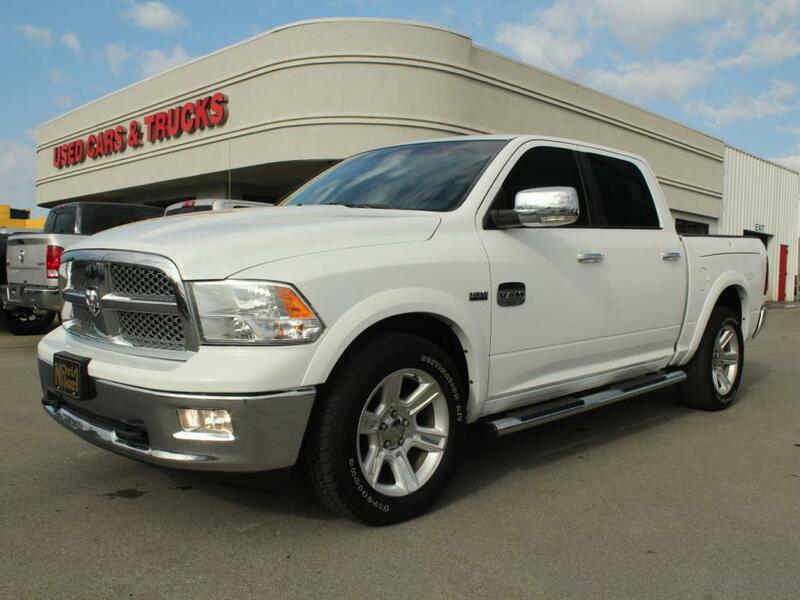 Drive with the confidence of a 5 Year/ 6 0,000 Mile Powertrain Warranty. 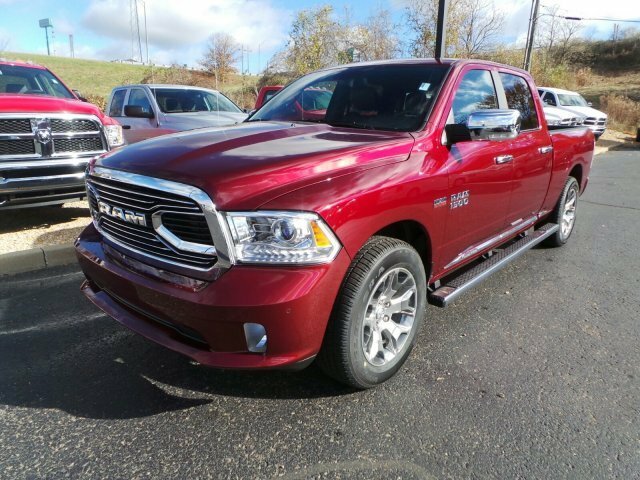 Chris Nikel Truck Stop has an incredible selection with over 200 trucks in stock, certified truck specialists, and fantastic deals on new RAM Trucks. Our Finance Department is on hand to help you fit a new truck in your budget with special programs, competitive rates, and flexible terms. Call 918-806-4126 for more information or visit our showroom. You'll find out just how easy it is to get your Nikel's worth. 1500 Longhorn, Longhorn, Drive this home today! This Ram won't be on the lot long! Take control of this high-value modern machine! This model accommodates 5 passengers comfortably, and provides features such as: heated steering wheel, power door mirrors and heated door mirrors, and voice activated navigation. It features four-wheel drive capabilities, a durable automatic transmission, and a powerful 8 cylinder engine. We pride ourselves on providing excellent customer service. Please don't hesitate to give us a call., Power Sunroof,Bucket Seats,Laramie Limited Group,115V Auxiliary Power Outlet,Folding Flat Load Floor Storage,Body Color Rear Bumper w/Step Pads,Body Color Front Fascia,Chrome Grille w/RAM Letters,Chrome Bumper Package,Bed Cargo Divider/Extender,Wheel to Wheel Side Steps,4 Adjustable Cargo Tie-Down Hooks,Delete Tow Hooks,Leather Wrapped Grab Handle,4-Corner Air Suspension Delete,Engine: 5.7L V8 HEMI MDS VVT,Steering Wheel Mounted Audio Controls,Ram 1500 Badge,Ventilated Front Seats,4-Corner Air Suspension,Rear 60/40 Split Folding Seat,Chrome Ram Badge,Heavy Duty Engine Cooling,Center Hub,Anti-Spin Differential Rear Axle,Laramie Limited Leather Bucket Seats,Hemi Badge,Laramie Limited Cluster,High Back Seats,Active Grille Shutters,Tip Start,Chrome Belt Moldings,Bright Rear Bumper,Power 10-Way Memory Driver and 6-Way Passenger Seats,Engine Oil Heat Exchanger,Electronically Controlled Throttle,Wood/Leather Wrapped Steering Wheel,Luxury Door Trim Panel,Monotone Paint,Bright Rotary Shifter,Heated Steering Wheel,Transmission: 8-Speed Automatic,Quick Order Package 26V Limited,Luxury Front and Rear Floor Mats,Limited Tailgate Applique 4x4,Chrome Bodyside Molding,Rear Window Defroster,Heated Front Seats,Wheels: 20' x 9' Painted Aluminum Chrome Insert,Body Color Fender Flares,Bright Front Bumper,RamBox Cargo Management System,Electronic Shift,Heated Second Row Seats,50 State Emissions Drive this home today! This Ram won't be on the lot long! Take control of this high-value modern machine! This model accommodates 5 passengers comfortably, and provides features such as: heated steering wheel, power door mirrors and heated door mirrors, and voice activated navigation. It features four-wheel drive capabilities, a durable automatic transmission, and a powerful 8 cylinder engine. We pride ourselves on providing excellent customer service. Please don't hesitate to give us a call. 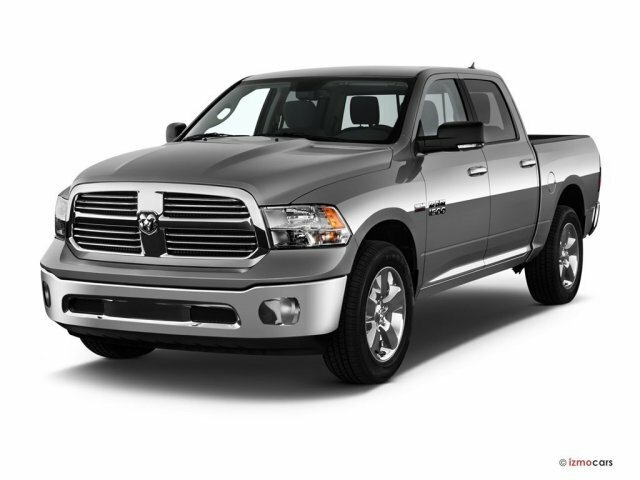 1500 Longhorn, Longhorn, Introducing the 2016 Ram 1500! It comes equipped with all the standard amenities for your driving enjoyment. Top features include air conditioning, heated and ventilated seats, rain sensing wipers, and power front seats. We have a skilled and knowledgeable sales staff with many years of experience satisfying our customers needs. We'd be happy to answer any questions that you may have. We are here to help you., Power Sunroof,Bucket Seats,Remote Proximity Keyless Entry,Laramie Limited Group,Chrome Tubular Side Steps,115V Auxiliary Power Outlet,Folding Flat Load Floor Storage,Wood/Leather Wrapped Steering Wheel,Keyless Go,Body Color Rear Bumper w/Step Pads,Laramie Limited Grille,Body Color Front Fascia,Luxury Door Trim Panel,Wheel to Wheel Side Steps,Leather Wrapped Grab Handle,Delete Tow Hooks,Monotone Paint,Auto High Beam Headlamp Control,Engine: 5.7L V8 HEMI MDS VVT,Rain Sensitive Windshield Wipers,Heated Steering Wheel,Steering Wheel Mounted Audio Controls,Transmission: 8-Speed Automatic,Ram 1500 Badge,Quick Order Package 26V Limited,Locking Lug Nuts,Ventilated Front Seats,Luxury Front and Rear Floor Mats,4-Corner Air Suspension,Rear 60/40 Split Folding Seat,Limited Tailgate Applique 4x4,Chrome Ram Badge,Rear Window Defroster,Chrome Bodyside Molding,Heated Front Seats,Wheels: 20' x 9' Painted Aluminum Chrome Insert,Center Hub,Bright Front Bumper,Body Color Fender Flares,Laramie Limited Leather Bucket Seats,Wheels: 20' x 9' Polished Aluminum,Laramie Limited Cluster,High Back Seats,Heated Second Row Seats,Chrome Belt Moldings,50 State Emissions,Bright Rear Bumper,Power 10-Way Memory Driver and 6-Way Passenger Seats Introducing the 2016 Ram 1500! It comes equipped with all the standard amenities for your driving enjoyment. Top features include air conditioning, heated and ventilated seats, rain sensing wipers, and power front seats. We have a skilled and knowledgeable sales staff with many years of experience satisfying our customers needs. We'd be happy to answer any questions that you may have. We are here to help you.